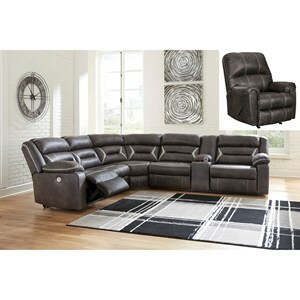 Featuring a casual contemporary design, this leather-look power reclining sectional offers a comfortable spot to relax. 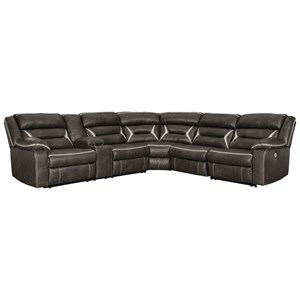 The sectional has three reclining seats, plush bustle backs, contrast stitching, and contrast panels add to the unique style of the sectional. USB charging is built into the power recline controls. The console also offers storage, and two cup holders with built-in lights. 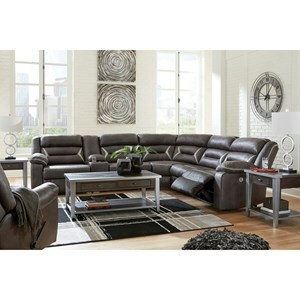 The Kincord Casual Contemporary Power Reclining Sectional by Signature Design by Ashley at Value City Furniture in the New Jersey, NJ, Staten Island, Hoboken area. Product availability may vary. Contact us for the most current availability on this product. 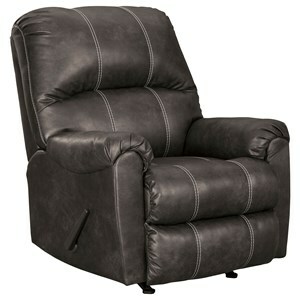 Browse other items in the Kincord collection from Value City Furniture in the New Jersey, NJ, Staten Island, Hoboken area.